It’s that magical time of year again, when people act a little nicer, think a little less of themselves, and buy into consumerism more than ever. Yes, it’s Christmastime, and as always, there are movies and television specials devoted to this holiday. More than that, there are songs and music videos released by all your favorite groups, catering to the warm spirit and financial possibilites of the season. Many entertainment companies are jumping on the Christmas bangwagon, as they do every year, and one of the most recent is SM Entertainment. 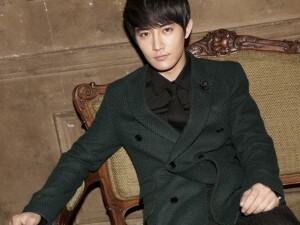 On the 13th, SM released their newest album, called “The Warmest Gift,” which is compiled of Christmas songs by all of SM’s groups. Because a review of this album has already been made by the ever lovely and eloquent Ree, I’m just going to focus on the fashion aspects of this album. “The Warmest Gift” was not a fashion-forward album. All the outfits have a disctinctive Christmasy feel, coming in colors of green, red, and white and incorporating sweaters, stripes, antlers, pom-poms, and fur to solidify the overall holiday, warm-and-cuddly look. Many outfits are ill-fitting and cheap-looking. Not all the artists were given full-body shots, some having only close-ups of their pretty faces. Let’s begin first with SHINee‘s Minho. Minho looks handsome in green skinny jeans, a red sweater, and a plaid shirt – the only thing really throwing off his look are the green pom-poms some nutter sewed onto his cardigan. Pom-poms are a reccurent problem with all of SHINee’s outfits. Next to Minho is Jonghyun, who is instead wearing a green sweater and red skinny jeans. 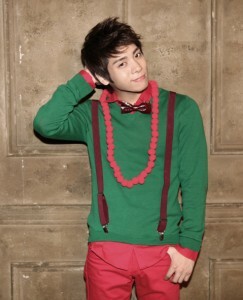 Jonghyun has unattached suspenders thrown over his shoulders and a red pom-pom necklace. On top of this, there is a shiny dark bow-tie. I find Jonghyun’s look to be a little too juvenile. 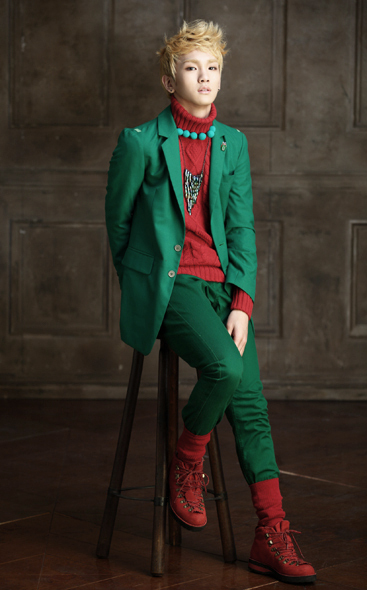 Key reminds me of a Christmas tree, wearing a lot of green and some red. 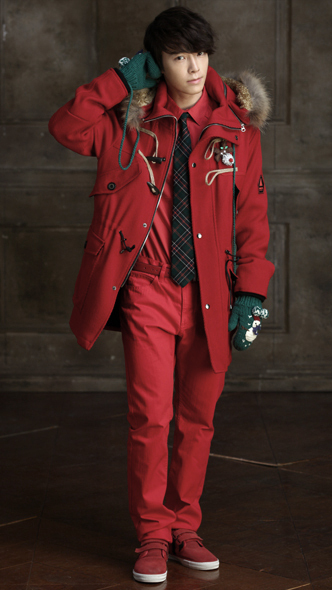 He wears it well, but Key’s outfit is just too Christmas-y. 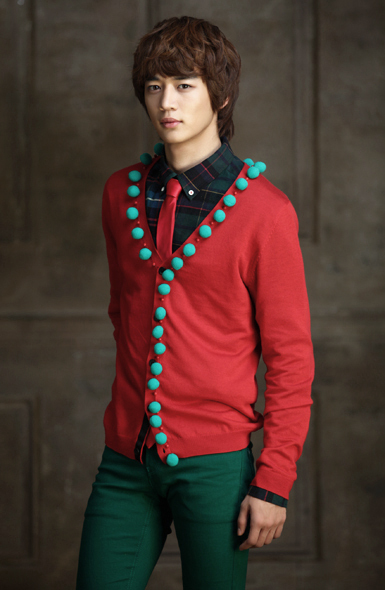 Next comes Taemin, who always wears an outfit reeking of holiday cheer. Green skinnies, green suspenders, green pom-poms, a red shirt, a striped hat – there’s just too much cuteness in Taemin’s look. Taemin is already a naturally adorable person–you can tell from his smile, so the added suspenders, bowtie, pom-poms, and hat weren’t needed. Onew, the lucky devil, managed to excape the green-and-red plague and even the pom-poms. 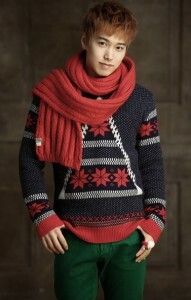 There’s just one white pom-pom on the end of his scarf. 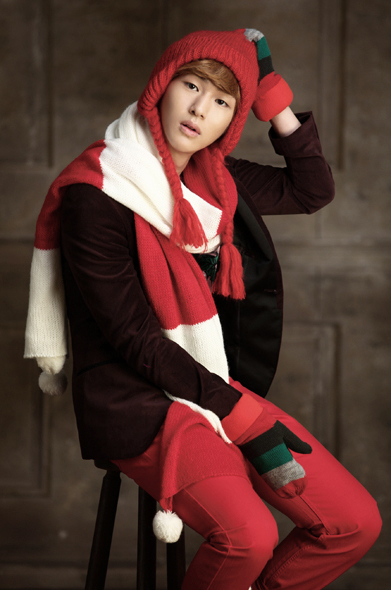 All bundled up, Onew looks cute and festive, but not as festive as his bandmates. 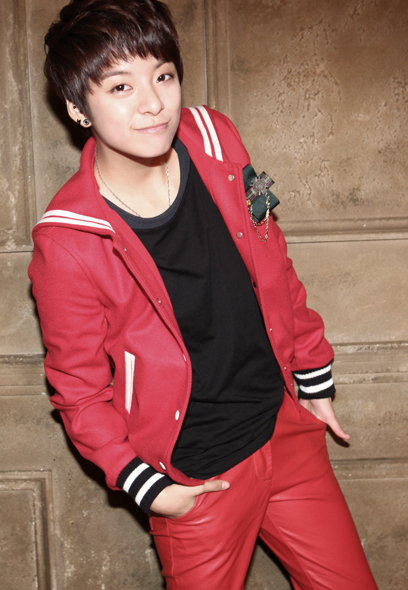 Amber from f(x) wears a red varsity jacket, black shirt, and red skinny jeans, looking very simplistic and tomboyish. I appreciate how Amber’s look isn’t overly festive and is instead very casual–she probably wears similar outfits every week. Victoria is always stunning and even in that lumberjack dress, she still manages to look pretty. Her outfit has a bit of an edge with chunky black booties and a spiked black belt but the (a little out-of-place) blue bow on her head adds sweetness. Krystal‘s outfit is a mess, though. She wears a cheap-looking red skirt, a distasteful and baggy shirt, and a green beret. TVXQ‘s Yunho is anything but a mess in his red suit. OK, yeah a red suit is a little tacky but they had to add holiday cheer somehow. 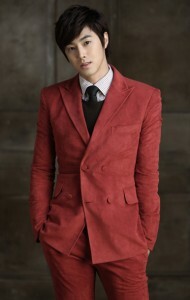 I think Yunho looks divine. TRAX‘s Jungmo looks hot in a red leather jacket. CSJH’s Sunday reminds me of Minnie Mouse with antlers, but she’s still very cute looking. 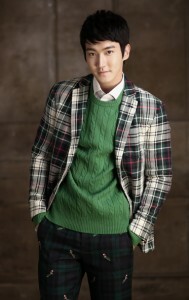 I don’t know how to classify Super Junior‘s Siwon‘s outfit. Nerdy-cool? Geek-chic? What is on his pants? I don’t even know. But I don’t like the sweater-jacket combination. It’s a little too UN-festive. TVXQ‘s Changmin dresses down his snazzy coat, vest, and bowtie with some red Converse. You could call his outfit a little strange, but I like it, and the boy looks darn good in it, too. 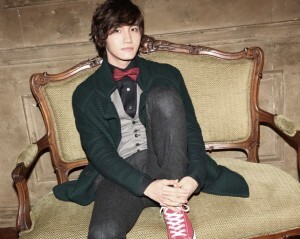 I like the dark green jacket, grey vest, black shirt, and red bowtie combination. TRAX‘s Jay is also dressed up all snazzy, but his outfit is entirely black. A bit of a sombre touch to an otherwise jolly photo shoot of outfits. More from Super Junior: Leeteuk joins the green skinny jean parade and has a puffy green vest. His outfit is casual and Christmas-y without being overly festive. Donghae is almost head-to-toe in red. For the most part, I’m fine with his outfit – except his tie keeps distracting me. 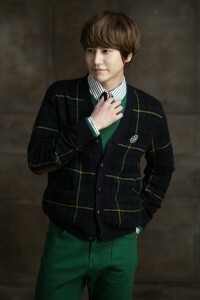 Kyuhyun looks very nerdy to me in his picture. Maybe it’s the bowl cut or perhaps it’s the sweater and tie. 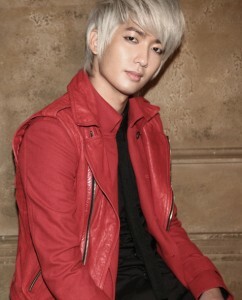 Eunhyuk wears an overly large and shiny red jacket. Little bunny Sungmin looks adorable and cozy with his navy sweater and red scarf. And I have only one question for Ryeowook‘s outfit: where’s Waldo? Zhang Li Yin wears a bright red coat that I would like if it weren’t for the cape-like sleeves. The sleeves ruin the coat for me, but she looks lovely nonetheless! SNSD‘s Yoona wears an ill-fitting white sweater dress. It hangs and sags unattractively around her slender body. Taeyeon has antlers, pigtails, and an oversized sweater. The sweater looks like it was made from a towel to me, but other than that, Taeyeon looks precious. Both Jessica and Tiffany wear dresses. Jessica’s dress was blah for me until I noticed the sequinned belt, then the dress became ugly. The print reminds me of teddybears, for no specific reason. Tiffany’s dress looks a little wrinkled and a bit too short. The dress is a little plain but the added belt creates cuteness. 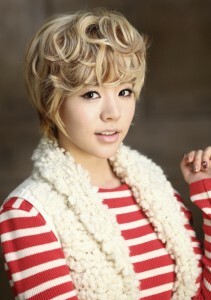 Sunny is the only headshot I’ve included for the sole reason of lamenting over her hair. When I first saw the wig, I loved it. Later, Sunny actually cut and colored her hair to match the wig, and she worked it. Now, I’m wishing she never cut it. Whenever I look at Sunny’s hair these days, the way it’s styled and how it looks with her outfits makes me want to cringe. Her hair has awkward little curls, making it frumpy instead of edgy. I want to end this article with my two favorite and least favorite outfits. 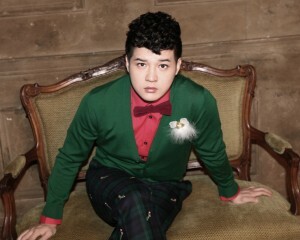 Shindong‘s outfit is my least favorite. Aside from the bizarre jeans and fluffy little angel pinned to his sweater, Shindong’s horrible curly top steals the show from Sunny’s hair. But at least J-Min looks rocker-chic in white skinnies, boots, a band tee, and a red leather jacket. Which of these looks is your favorite? Stay tuned for my second installment of K-pop Christmas MV fashion!